What a fun three weeks this has been visiting blogging friends in the Crafted Appliqué: New Possibilities Blog Hop. I've been so thrilled that so many of you have been following along! We've seen some of the most wonderful, creative people in action! If you are just now joining in, it's well worth hopping around to see what you missed. Today kicks off week four and starts with Susie over at Susie's Sunroom. Wow does she have a beautiful quilt to show you and she's sweetened her book giveaway with a second giveaway of something delightful that she made for one lucky commenter! We've got five more wonderful quilters lined up this week, so I hope you'll pay a visit to each and every one! The blog hop calendar is shown at the end of this post. You'll have a chance to win a free copy of "Crafted Appliqué: New Possibilities" at every stop too! Plus, I'm launching another new giveaway today here on BuzzinBumble. I'll tell you about that in just a bit. It's time to show you another one of the projects from my book Crafted Appliqué: New Possibilities. This week's project was something I designed to use as the centerpiece of a sampler quilt that I intend to make for my daughter Bean & her husband Gonzo. It would also make a beautiful quilt of it's own and all those leaves make it perfect for a family tree or a signature quilt too. I want to tell you all about what my friend Julie did. We met each other back when I was looking for someone special who could custom quilt A Quilt for a Hero - a project I had made for Homes For Our Troops. I found her business, Pines and Needles Quilting, through a local quilt shop. She goes by @sewjul on Instagram if you'd like to see some really fabulous quilting. It was not long after I learned that the AQS wanted to take on my book that I asked Julie if she could quilt The Walking Tree for me. But... there also was not much time left before the submission deadline. She always has a packed schedule, but she said yes! Not only that, but she also asked if I had any quilts she could bind for me, to help me out. :o She then surprised me by making beautiful, embroidered labels for my book projects. And... back then I was crappy at hand sewing bindings. But Julie sat me down and showed me how she does it, using Edyta Sitar's method. I've been doing them her way ever since. Wasn't that just so wonderful of her to do all that? :) So I hope you read this Julie, because I'm shouting out a really Big Thanks to you! For The Walking Tree, I wanted it to have a Narnian, dryad like quality, so I tried to arrange the leaves in a way that makes them look like they are dancing with the breeze. I think Julie did a great job of continuing that feeling with her quilting! One of the things I want to do is encourage people to share projects they've made using the Crafted Appliqué method. I'm a real newbie on Instagram and Facebook, and only beginning to figure out how to navigate those waters, so Heidi (Red Letter Quilts) started the hashtag #craftedapplique for me. It will be a terrific way to be able to share and see what we make with the Crafted Appliqué method! Another thing I hope to do soon is to put a permanent linky feature on the page tab for Crafted Appliqué. (Top right hand side of BuzzinBumble) That way you all can link up projects you've made and also visit other people's links too. I just have to figure out how best to do that. Colleen is also offering a copy of Crafted Appliqué: New Possibilities as another giveaway prize, so be sure to check out her Splendid Sampler post! This week, I'm giving away a fat eighth bundle of 22 Basic Grey Moda Grunge colors, from one of my favorite places to shop for fabric on Etsy: WinterCreekCloth! Dana, the owner, has a most unusual shop! She curates custom bundles of quilt shop quality fabrics, most often by color, and shopping there is a quilter's dream! This bundle would be great for appliqué projects too! 1. To enter for a chance to win, simply leave a comment on this post. If you'd like to, you could tell me whether you prefer to piece with scrappy fabrics or with coordinated collections. Everyone is welcome to enter the giveaway contest and I'm willing to ship internationally. All the giveaways here on BuzzinBumble will run right up until the end of the Crafted Appliqué: New Possibilities Blog Hop. Winners will be randomly drawn on June 4th and I'll announcing all the winners during the final post of the hop on June 5th. If you'd like to see the first three giveaway contests, there is still time to enter! *Please note*- If you are a no-reply blogger, remember to leave your e-mail address so that I will have a way to contact you if you win. Don't forget to visit the Crafted Applique Blog Hop Stops for a chance to win a copy of my book too! Again,lots of ideas from a wonderful book. I use batiks, mainly, and a wide variety of colours. I haven't done much with a range of matching fabrics . I hopped to Colleen, again , inspiration galore there. And reading down the list,from May to June, I can see some of my favourite blogs there, that are already on my list. Greetings from Jean in a cold New Zealand tonight. Your quilt is lovely - I love the leaves swaying in the breeze. I usually use a range of fabrics that coordinate - that works best for me! At the moment I use co-ordinated collections - trying to build up plenty of scraps from them to make scrappy quilts and other things! Love the tree! I am a scrappy piecer, but I also have some collections in my stash, lol! Love the Walking Tree quilt. I use scraps hoping that I will see the stash decrease, but no luck thus far. That tree would make such a gorgeous central medallion for a quilt. I generally mix and match from my stash but have used coordinated collections in the past. Love the fabric bundle! I am definitely a scrappy fabrics quilter. These new fabrics would fit right in with my stash! Jspwarren at aoldotcom. I follow your blog via the link on Kevin the Quilter 's blog. Walking tree!!! I love Narnia, and CS Lewis of course! What a beautiful project, and quilted beautifully too. 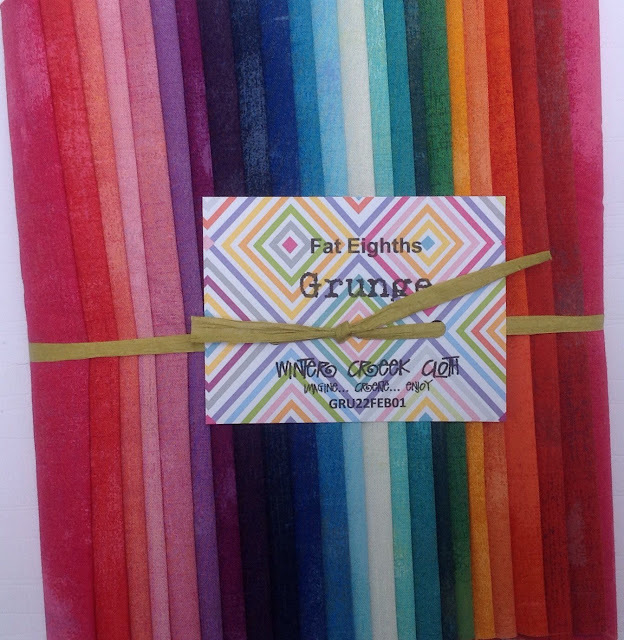 That's a wonderful bundle of fabric you are offering for giveaway - grunge is one of my favorite fabrics and perfect for applique!!! Following you via Bloglovin and Instagram! Thank you for the past 3 weeks of high inspiration. Week four come on! Hi Lara, following you via Bloglovin. Love your Homes for Troops Quilt, especially the detail around the eagle. I follow on blogger in my blog list. Also follow on Blog lovin just incase Blogger does in my list with more silly changes. Coordinated pieces....and scrappy...depending on the project. I love that tree!! The leaves really do look like they are dancing in the wind. I use coordinated prints once in awhile as a treat. Mostly I use things from my stash and it usually works out pretty well. 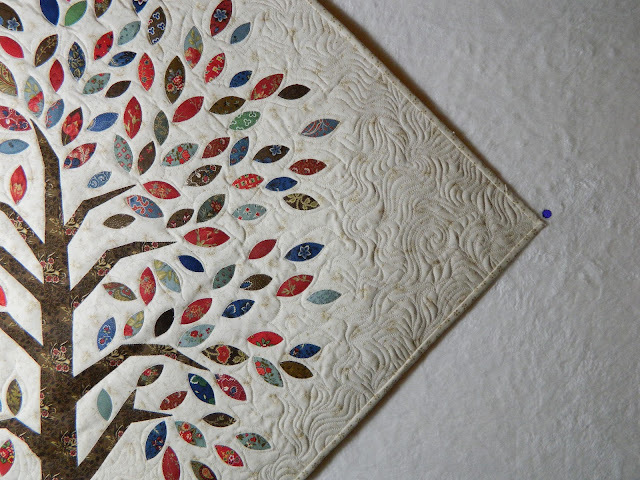 I don't use collections very often, so I would say I am pretty scrappy :-) Great tree and quilting! I love to dig in to my scraps. Especially if they are solids! I've been known to grab print collections, but only because they all go together so beautifully and I don't have to deal with matching...prints scare me!! I love all scrappy quilts but once in awhile I like to coordinate all my fabrics. I love to applique so this book is of great interest to me. Thanks for the giveaway. I love using up scraps first. I guess I know I would be cutting into yardage for bindings, borders and backings, which of course will create more scraps from those fabrics, so I choose scraps to make blocks with. Hi Lara, you know I enjoy following you. I'm a scrappy girl at heart. But I love the look of collections. So I mostly combine both :-) Thanks for the great blog hop and giveaway! 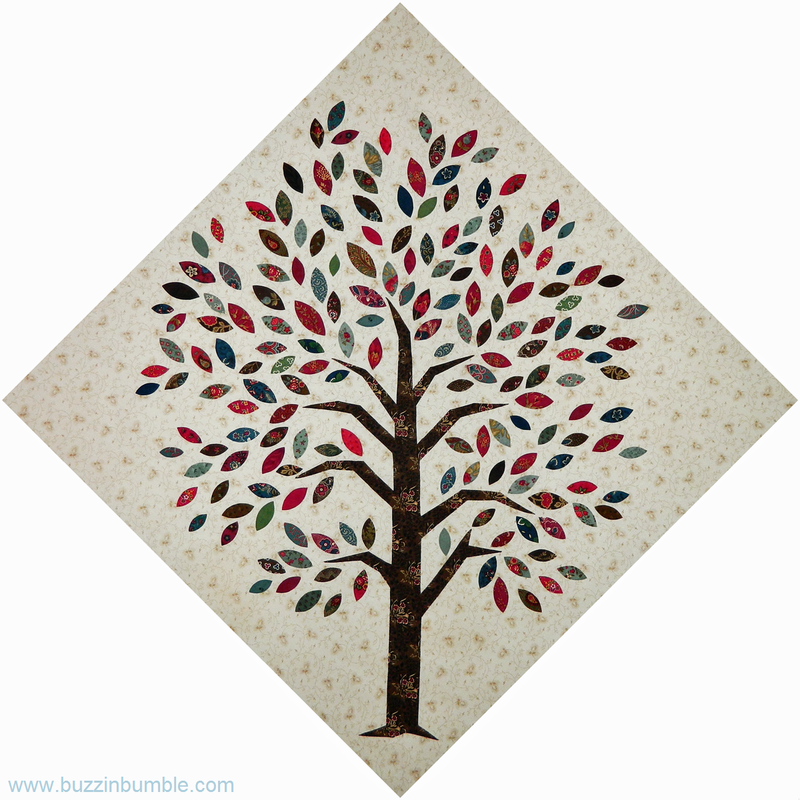 Love your tree quilt! I'm mostly a scrap quilter. I generally work from scraps and stash. When I use a collection I usually add lots of my own stuff to it, just to mix it up. I follow by GFC. This book looks wonderful, I'm anxious to learn your technique. The Walking Tree is so beautiful Lara and the quilting that Julie did is perfect for it! It has been so much fun using your method and now I am off to check out Colleen's project! i perfer to piece from my stash but when i need something i don't have i usually go with fat quarters. Good Morning! I have always pretty much used scraps in my applique projects. I truly am a scrap lover! The applique projects that I have seen are all so fabulous! I truly hope that I am a winner of one of your books; I really want to try your method. Thank you for the opportunities to win all of these magnificent prizes! Have a fantastic creative day! I found your blog by following a link on Bloglovin and am definitely a follower through Bloglovin and by email! I am excited for my turn on your hop this Friday. The project I will be sharing was made from a scrap from a long ago project. Cannot wait to share! I'm certainly having fun and finding #CreativeGoodness by visiting all the blogs in this new book celebration blog hop. I also love your new hashtag #craftedapplique and will use it as I share on Facebook and Twitter. PS - Beautiful collection of fabrics. Dana certainly has an eye for color. I'm off to check out her online store now. Hi Lara, Your tree is quite wonderful! I buy fat quarter bundles but also have a lot of scraps which I try to use for small projects. I'm always worried I might think of something better to use the large pieces on, and also I tend to forget to buy plains and low volumes! Really great book celebration/blog hop, Lara. when piecing i tend to coordinate my fabrics. cant seem to quite get into scrappy. I usually start with coordinated collections but manage to add in some of my scraps that fit with the project I'm working on. I do use scraps for small pieces, but often need bigger pieces for my projects. I have bought coordinated fabrics for some of my projects, but I always add at least one fabric from outside a fabric range to give a bit of sparkle. For most of my projects I would dig in my boxes of FQs, half yards, and large pieces from all kind of fabric lines to find a combination that suits what I have in mind. Love your tree! And I learned something about binding from you. I had not seen Edyta's method. Now I can't wait to try it. I tend to use coordinated collections for donated quilts because it reduces planning time. But for my own quilts, I either use my stash/scraps or shop yardage for whatever look I want. Hi, again, Lara. I follow on bloglovin' and facebook, instagram and email! I usually like to do scrappy blocks...for me, the more, the merrier! Thanks for sharing the giveaway! I'm a happy scrappy gal! Hi Lara: I follow on BLoglovin. Sometimes I use collections but I prefer to just pick out different fabrics that I like that aren't in a collection. i definitely like to work scrappy. It is more of a challenge to find fabrics that worl together, though and makes more of a mess! I tend to gravitate toward a coordinated look, but sometimes I 'force' myself to go more scrappy. I love scrappy quilts I guess because that's what I grew up with, but I do love the look of matching fabrics. I normally have the quilt idea first and piece with fabrics that suit the idea (normally what I can find in my stash), but I love seeing coordinated collections bundled together like this. Your friend, Julie, sounds like a saint. She does a great job of quilting, too. Hi Lara! I follow you on my blogger reading list. I prefer to piece with coordinating fabrics. I'm still learning, so that may change as I learn more! I really like both. I love scrap quilts but sometimes the coordinated sets are just wonderful in my book. Depends on what I feel like. I think I am a scrappy quilter as I use any fabrics that look good together to make a quilt. Thanks! Hi Lara, I love your tree, it does have something magical to it! I like coordinated fabric collections, but I don't want fabric designers to do all the choosing for me, I think putting fabrics together is one of the most fun stages in creating a quilt! And, Lara, I follow you on Bloglovin'. lynnstck(at)yahoo.com p.s. I LOVE the tree! Hi Lara! I won your book in one of the give aways. I read it yesterday, will read it again and then give it a try--thank you so much!I love your walking tree quilt! I started following you by email. I prefer to quilt with a range of fabrics, so scrappy is my favourite. Having said that, however, I do love the way an entire range looks in a quilt! I've done that with a couple of quilts, and I have a couple more precuts packs sitting patiently waiting their turn to grow up. :-) You know how much I LOVE your Walking Tree quilt... Thank you for this once again SO AMAZING giveaway. I'm a semi-beginner quilter and I'm really drawn to the scrappy look. I love scrappy quilts in general -but my most recent is a coordinated palette quilt. I have to say that I am really loving this one. I love coordinated collections, but I'm scrappy at heart. I always find myself mixing and matching different collections and fabrics. This book looks amazing- can't wait to get it! I find it less stressful to work with bundles1 lol. I loved reading your story behind the tree. It sounds like a great friendship was made as well as a quilt. I'm a bit addicted to collections - the designers do such a wonderful job making the fabrics work together - I usually cannot bear to break them up. The Walking Tree quilt is amazing. I like collections as they are meant to coordinate, but most of my quilts are more the scrappy kind. I can go scrappy - as long as the fabric is coordinated. I end up trying something scrappy at LEAST half the time. I like making my own fabric matches and cross collections frequently. It helps me feel that what I am making will be unique. I love patterns like this tree that are open to so many color possibilities! I follow you through my Blogger Reading list. I'm a scrappy piecer. (That doesn't really sound nice, does it??) I have plenty of fabrics in my stash, so I try to use up smaller yardage when I applique or need to coordinate with another fabric. It's rare that I don't like what I've put together! Lara, your appliqued tree is gorgeous! I never tire of your creations. I'm a Bloglovin' follower of yours! I'm not confident about my color choices so I prefer coordinated bundles. But as my scrap pile grows, I'm going to have to step out of my comfort zine and go scrappy! Thanks for all the wonderful eye candy on your blog, and for the chance to win! I absolutely love your tree! I follow you o Bloglovin! Thanks again. I find it much easier to piece from a collection as all the hard work is done for you but piecing from random scraps is more rewarding when it comes together! I do both. I've made scrappy quilts and quilts made by collection. I love them both! Thank you. Some of my favorites collections are tonal fabrics in every color of the rainbow pieced on black. Thanks for the chance to win! I seldom make quilts with a single collection. I'm always adding in more fabric to make the quilts sparkle. Thanks for the great giveaway. I love that Grunge fabrics and have been buying and using different yardages of it for years! Looks like they have a few new colors, thanks for your generosity for all of your giveaways, this one AND the many books you are giving to "sew" many is amazing. I already am a happy follower. Love anything quilt, planned or scrappy. Don't count this comment for your giveaway, but it's a Rumi poem that when I read it with my online course, I thought of your dancing tree and just had to share it with you. Life flowers from the tree of its great good fortune. It drinks it fill from the Fountain of Spring. It unrolls its bed in Eternal Delight. I love piecing with scraps but sometimes it is nice to have everything coordinated!! Thank you for sharing you beautiful quilts and you generous shout outs to your helpers! It tend towards a balance of scrappy and coordinated. I really like piecing w/ fabric lines: I'm not always confidant with my fabric choices, so it's good to get help in this way. I'm going to have to get your book: it looks so intriguing!!! I'm following you now via email. I follow ur blog via email.. I guess it's the genealogist in me that finds this tree design so appealing. You did an amazing job with the design and sewing all those leaves.... And the quilting is superb! Loved reading about your inspiration for this. I'm getting ready to order your book, Lara. I've been convinced by all the wonderful presenters, the projects, and your magical applique method! I've just recently started following you with Feedly. Your tree is beautiful. Great job!! I think I need to get your book. I've been seeing so many wonderful projects out there. I bought the book and found it to be so amazing. Love that tree! 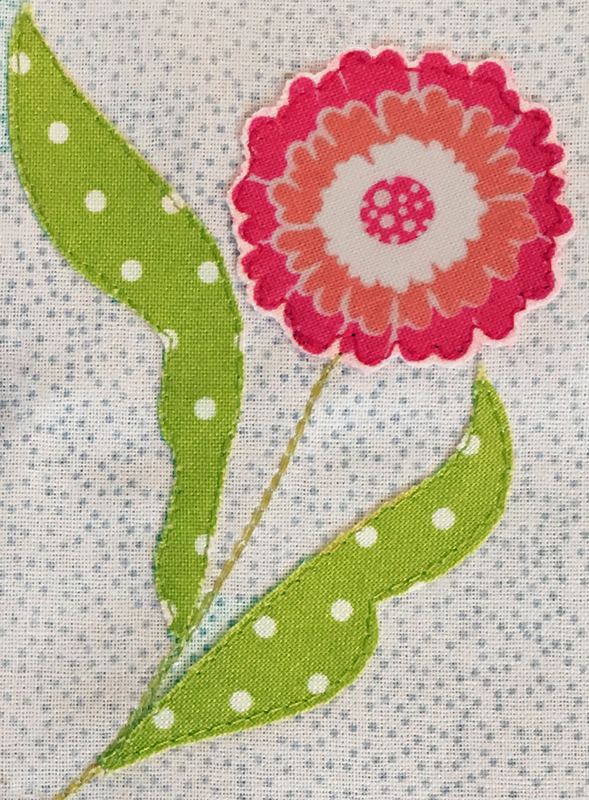 When piecing or applique, I usually use my own combination of scraps or yardage because it's more affordable. Thanks for the opportunity to win. Love your tree! I use my own combination of scrapes and yardage. Love the tree. The quilting fits it perfectly. Your tree is wonderful. I love to quilt with scraps but every coordinated bundle of fabric is just more scrap possibilities anyway...I just love fabric. Thanks for the chance to win more wonderful fabric. I haven't done much applique, but it's a technique I would really like to try further. I love piecing scrappy. Your Walking Tree is gorgeous. I am definitely have Crafted Applique on my wish list. Thanks for hosting this fabulous blog hop. I am slowly but surely embracing the scrappy. Hoorah! Love that tree! I would like to be scrappy but am too chicken. One day I'll get there! I like scrappy possibilities for quilting.............and have a huge tote full of bits and pieces to attest to it. I recently started following you! I LOVE the Grunge fabric!!! Another neat project! Great to have such a quilty friends who helps us out! Well done both of you!